NordPlant is a climate and plant phenomics university hub for sustainable agriculture and forest production in future Nordic climates. Climate change is a global challenge and new plant breeding and protection efforts are urgently needed. Novel methods in plant phenotyping and climate facilities, which is the core of NordPlant, will be central to better understand plant stress responses and to develop advanced and precise methods for rapid screening of plants to identify high-performing ones suitable for the future climate scenarios. Five Nordic universities with versatile and complementing research infrastructures have established NordPlant to promote education, research mobility and technological development to meet future challenges in Nordic agriculture and forestry. NordPlant is one out of a total of six Nordic University Hubs funded by NordForsk. NordPlant will stimulate knowledge-exchange by seminars, site-visits and joint education for PhDs, post docs and researchers. 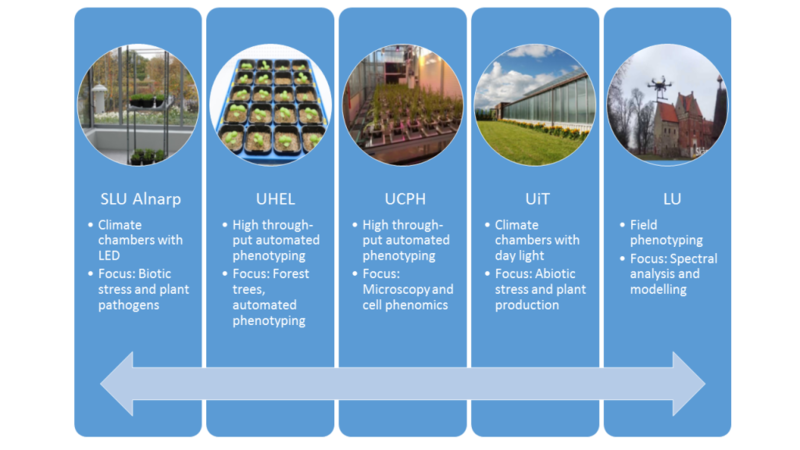 The consortium will greatly simplify the utilization of the world-class high throughput plant phenomics technologies and advanced growth facilities already in place in the Nordic countries. This will be done by providing reduced user fees and mobility grants for participating partners when they are using each others research facilities in joint research projects. This is necessary to overcome the economical and practical hurdles of running experiments within a project at multiple, but complementary sites. 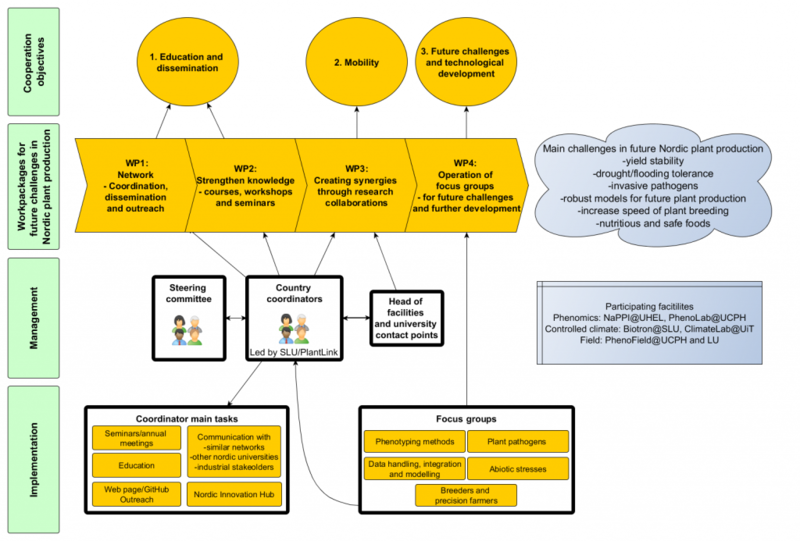 If these hurdles are overcome, the cross-university use of facilities will lead to a more optimized use of single facilities and also benefit the individual projects as the facilities are complementary and new research and broader questions can be asked. The complementary nature of participating research facilities as well as knowledge at the universities will be a hotbed for new ideas leading to joint projects. This will also ensure long-term collaborations beyond the running time of NordPlant. In addition, strengthening the knowledge and Nordic competence in this area will be valuable for future development and establishment of new similar and complementing infrastructures for plant phenotyping and controlled environments. NordPlant will address a number of focus areas: plant pathogens in new Nordic climate conditions, retained biomass production in climate change, forestry in automated phenotyping, microscopy and plant cell phenomics, modelling including remote sensing and ecosystem modeling and field phenotyping. NordPlant will focus on and especially benefit plants important for the Nordic countries both economically and culturally, namely potato, wheat, oat, Nordic berries, apples, sugar beet and birch. protection strategies in the Nordic climatic zone. Research around plant climate facilities and phenomics platforms are inter-disciplinary in nature. To create a truly Nordic network and use the best expertise at hand, Nordic universities outside the core five will be invited to NordPlant as associate partners. NordPlant will strengthen the knowledge on how to use controlled climates and phenomics for plant research to test and predict the effects future climate scenarios in the Nordic countries. Findings from controlled and greenhouse environments need to be related to field analysis. A strong component of NordPlant will therefore be field phenotyping and advancing the knowledge and use of remote sensing techniques for field conditions as well as to relate findings in controlled environments and field. This component will improve methodology for upscaling results from controlled sites to large areas. NordPlant will integrate different data types, which is one of the current main challenges in this research area. Omics data will be tightly integrated in the NordPlant projects. Data integration will also help translational research, which is essential to translate findings in model plant species to crops and trees. This type of research produces large, multi-faceted data sets. To this end NordPlant will help through education and provision of open-access protocols to homogenization of standards also aligning these to global standards. This will ensure interoperability and compatibility of the data, which are essential for its usefulness. NordPlant will guide Nordic researchers to deposit their data in an appropriate way to ensure durability and usability over time. New algorithms and code will be deposited in open access data bases and we anticipate more than 18 publications all in open access journals.